South Wangaratta stretches along the foothills of the Warby Ranges, with an abundance of interesting flora and fauna. Major Mitchell originally named the Warby Ranges as “Futters Range” during his travels through the area in 1836. Robert Futter was, according to Mitchell, “a successful and public spirited colonist”. Ben Warby was an early settler in the area with the Warby family arriving in 1844, the Ranges were then renamed the “Warby Ranges”. In 1979 most of the Warby Range became a state Park. A large part of the Lower Ovens River was also included, so, the name “Warby Ovens National Park”. The total area is 11,460 ha. The Warby Range consists of granitic intrusions with vegetation that is typical of rocky, gravelly and sometimes shallow soils. 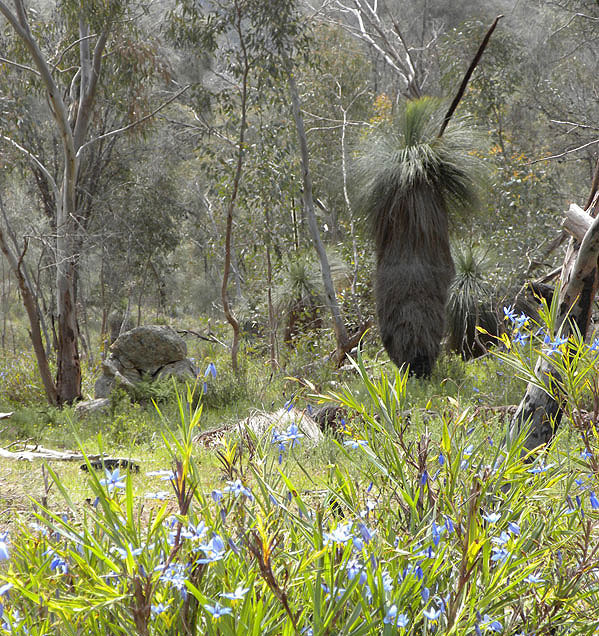 The species composition includes eucalypts, wattles, orchids, grasses, composites and peas. An interesting feature is the large numbers of grass trees. The woodlands are, also, an ideal habitat for much wildlife, mammals, reptiles, birds and frogs. The open forest sections of the Warbys are dominated, mainly, by Eucalyptus Blakely (Blakely’s red gum), Eucalyptus Macrorhyncha (Red stringybark), and a range of Boxes such as Eucalyptus Polyanthemos (Red box), Eucalyptus Melliodora (Yellow box), Eucalyptus Microcarpa (Grey box), and Eucalyptus Albens (White box). There are eleven species of Eucalypts that grow in the Warby Ranges. There are, also, small, communities of Callitris Glaucophylla (White cypress pine) and copses of Casaurina Stricta (Drooping she-oak). In the understorey Acacia Buxifolia (Box leafed wattle), Calytrix Tetragona (Common fringe myrtle), and Grevillea Alpina (Cat’s claw grevillea) abound. Among the groundcovers are small prostrate herbs, grasses and ramblers, such as; Hardenbergia Violacea (Purple coral-pea), Dillwynia Phylicoides (Small-leafed parrot pea), Hibbertia Obtusifolia (Grey guinea flower) and Microlaena Stipoides (Weeping grass). Several small ferns and up to forty species of orchids inhabit specific locations throughout the Warbys. The Fauna of South Wangaratta, particularly in the Warby Ranges is diverse and interesting. Reptiles include snakes, goannas such as the big Lace Monitor and the Sand Goannas, lizards including the Blue Tongued Lizard, skinks, geckos and the endangered Inland Carpet Python. The marsupials are the popular Eastern Grey Kangaroo and the Black Wallaby, as well as possums, both Brushtail and Ringtail, gliders, koalas and wombats. The monotrenes are the echidna and the elusive platypus.